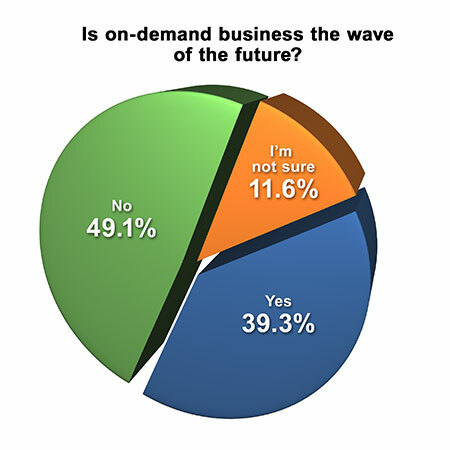 Will You Catch the On-Demand Wave? CHICAGO — Do you see on-demand business as the wave of the future for dry cleaners? A little more than one-quarter of dry cleaners surveyed (26.3%) say they offer a website or mobile app that customers can use to order/schedule drycleaning pickup and delivery. 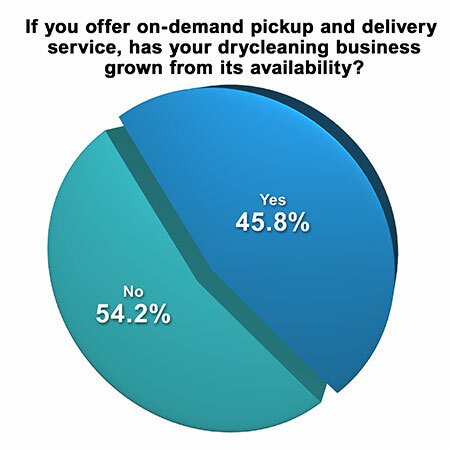 Slightly more than one-third (35.7%) of those who don’t offer on-demand drycleaning services say they are considering doing so. Of those who offer on-demand services, about half (45.8%) say their drycleaning business has grown from use of the on-demand technology. And of those who have a website or app, 38.9% developed their own service while the remaining 61.1% used an outside company. The availability of on-demand service is “positive, yes, but in our experience, customers still prefer coming into our stores,” one cleaner points out. The American Drycleaner Your Views survey is a snapshot of the trade audience’s views and should not be considered scientific. Qualified subscribers to American Drycleaner e-mails are invited to participate in a survey they can complete anonymously online.